Wandering around the coastal town of Portsmouth, NH, I had my eye fixated for some public art or graffiti – curious to see if this pretty town had some hidden in one of its old alleys. And then I spotted this shark, part of a mural project done in 2011 – and not surprisingly, a bit controversial. Although it was all done on private property in cooperation with building owners, the art commissioned raised many an eyebrow and some of the art is no longer on display. 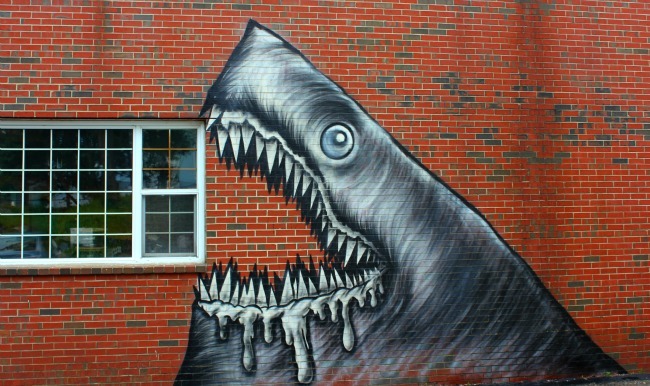 But this shark made the cut – a bold, over six feet high mural – which is close to the harbour and not on a main street. Is that why its still on display, since its not in the main downtown zone? Or does the building owner like the shark, a toothy beast that does come to mind when it comes to the sea? I applaud Portsmouth for trying something new – and on my first day, I could see the preservation of old buildings and transformation into new use, the lack of chain stores and plethora of local restaurants, cafes and retail businesses as well as strong arts and cultural scene. It makes for a port town that goes farther to not just support its past but reach into the future, and to try something new. That’s what makes places like this attractive to not just those who know, but to those who will be lured by the festivals and new ideas, and thrilled by the history. « Do you need to be in the picture? What a perfect way to put it! “…a port town that goes farther to not just support its past but reach into the future, and to try something new.” We all try to keep Portsmouth alive by focusing on the people and their ideas while we hold onto what we love best.